During a workshop in Sao Paulo in 2002, Marcelo Araujo, director of the Pinacoteca do Estado Sao Paulo asked us to realize a work of art for the so-called Octagon, the central room of the Pinacoteca. 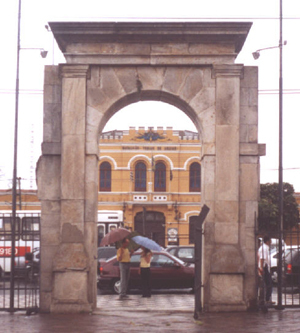 He suggested to include the portal of the town prison, which was pulled down in 1973 and is today a relic situated nearby the Pinacoteca. The town prison Presidio Tiradentes had been the place of imprisonment for political prisoners in the time of the Brazilian military dictatorship. 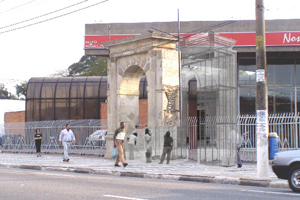 The portal of the former town prison of Sao Paulo, Tiradentes, which after the pull-down of the prison had been preserved as a relic not far from the Pinacoteca, will be reconstructed in a 1:1 scale in the form of a bird-cage. The cage is an assembly of single parts so it can be taken apart, stored and reconstructed at another place without much effort. 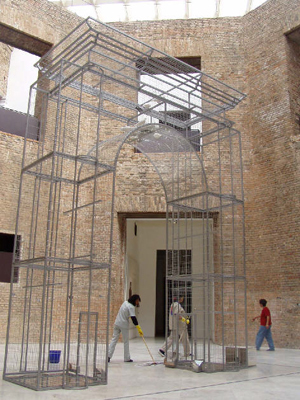 The cage is manufactured by the workshops of the Pinacoteca. 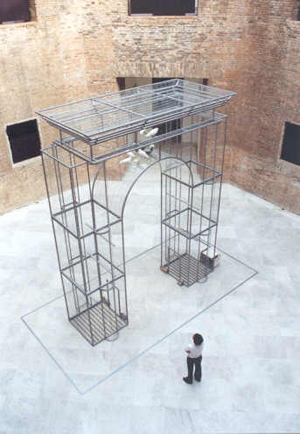 The prison portal in the form of a bird-cage will be erected in the central octagon room of the Pinacoteca. As the lateral walls of the Octagon room are broken by huge portals as well and the museum room is lightened brightly by a skylight, the architecture of the museum is a perfect frame for the portal sculpture in the form of a cage. Originally, we had the idea to fill the cage with different colorful birds from all over Brazil. We projected to dedicate those birds to single political prisoners during the military dictatorship at the end of the 1960s and the beginning of the 1970s. Every day, one of the birds would be set free. At the end of the exhibition, the cage would be empty and all birds were in liberty again. Due to legal regulations and hesitations expressed by ornithologists (IBAMA) it was not possible to realize the project with Brazilian bird species. Instead, we now accomplish the work of art with messenger pigeons. In respect of imprisonment, liberty and peace, pigeons own a high symbolic value. Furthermore, messenger pigeons return to their home as do prisoners coming out of the prison, and they transport messages. During the exhibition, the museum staff is taking care of the living works of art according to the instructions by the ornithological scientific counselors. Every three days, a pigeon is set free and returns back home. As it is prohibited to bring pigeons to Sao Paulo, every pigeon has an import license, a certificate of health and a flying license. The return of the pigeon to its home place must again be registered. This way, the pigeons in the prison portal cage experience a similarly bureaucratic administration and monitoring as imprisoned persons. Bureaucracy is becoming part of the work of art, the work of art is becoming part of the bureaucracy. As prisoners, the pigeons in the Pinacoteca are remembrances of the history of Tiradentes being a former prison of dictatorship. The released pigeons demonstrate hope. Being messenger pigeons, they carry home a message. They are a symbol for liberty and orientation in a complex world. What remains is the empty cage in the form of the prison portal and the possibility to fill it again. The original portal made of stone is only a few hundred meters away from the Pinacoteca. Ignorant people could regard it as the portal of an antique castle. On the former prison area, today a bank is located. Most of the visitors pass through the prison portal to the bank without knowing the history of the place. The prison portal of the Presidio Tiradentes in the form of a bird-cage in the Pinacoteca is a work of art that reminds us, with all its references to imprisonment, liberation, orientation, homecoming and memories, of the history of the Presidio Tiradentes. 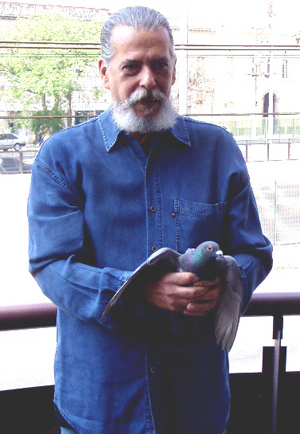 During the opening of the installation, the first pigeon was set free by the Brazilian journalist Alípio Freire, a former political prisoner of the prison Presidio Tiradentes. Every Saturday, another pigeon is liberated until the 7th of September, the day of the Brazilian independence. On that day, the cage will be empty. 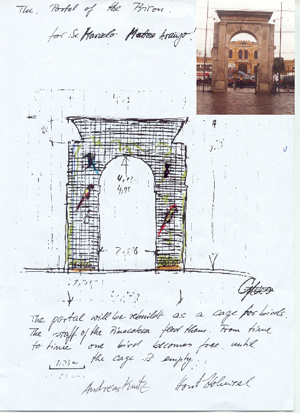 In 2004, the year of the celebration of the 450th anniversary of the foundation of Sao Paulo, it is planned to realize the artists’ suggestion to install the portal cage lastingly, after the exhibition has finished, behind the original portal. The installation Pássaro Livre/Vogel Frei/Bird Free by the German artists Horst Hoheisel and Andreas Knitz in the frame of the Octagon Project realized by the Pinacoteca do Estado is a poetic image for a passage of the recent Brazilian history. Looking back at a cooperation of almost ten years now, the artists developed suggestions for interventions and constructions in the public and private space referring to the history of the place in question including the social, political and cultural conflicts, e. g. the former concentration camp Buchenwald, the town hall in Kassel or the port of Tel Aviv. Those works question the basic concepts of remembrance and memorial, of imprisonment and liberty; they look behind the historical stories seeing the problems, they involve archives and witnesses, and create “memories/counter-memories”, how the artists call it, to confront the institutionalized history with. Pássaro Livre / Vogel Frei / Bird Free is a bird-cage, which imitates in real scale the entry portal of the destroyed town prison Tiradentes, today put under preservation as national historical legacy. The building is one of the oldest in Sao Paulo, just a few meters away from the Pinacoteca. It is known as a place of political and social repression during the military regime in contemporary Brazil. With the reconstruction of the portal, the artists create an ambience which re-transforms those segregated places of closeness into prisons; in this special case, into the town prison of Sao Paulo with its special history. The artists put pigeons inside the building, setting free some of them weekly, the pigeons thus being a reference to the prisoners having been in that prison. The pigeons have an own meaning as well as they illustrate the desire for peace and harmony.